Out of the depths I have cried to You, O Lord; Lord, hear my voice! Let Your ears be attentive to the voice of my supplications. If You, Lord, should mark iniquities, O Lord, who could stand? But there is forgiveness with You, that You may be feared. I wait for the Lord, my soul waits, and in His word I do hope. My soul waits for the Lord more than those who watch for the morning--Yes, more than those who watch for the morning. O Israel, hope in the Lord; for with the Lord there is mercy, and with Him is abundant redemption. And He shall redeem Israel from all his iniquities. "Grace and peace be multiplied to you in the knowledge of God and of Jesus our Lord, as His divine power has given to us all things that pertains to life and godliness, through the knowledge of Him Who called us by glory and virtue, by which have been given to us exceedingly great and precious promises, that through these you may be partakers of the divine nature, having escaped the corruption that is in the world through lust. But also for this very reason, giving all diligence, add to your faith virtue, to virtue knowledge, to knowledge self-control, to self-control perseverance, to perseverance godliness, to godliness brotherly kindness, and to brotherly kindness love. For if these thing are yours and abound, you will be neither barren nor unfruitful in the knowledge of our Lord Jesus Christ" (2 Peter 1:2-8). [Orthodox Scriptural Commentary (The Orthodox Study Bible): "Being renewed by God's power, we become "partakers of the divine nature." This does not mean we become divine by nature. If we participated in God's essence or nature, the distinction between God and man would be abolished. What this does mean is that we participate in God's divine Energy, described by a number of terms in Holy Scripture, such as glory, life, love, virtue, and power. We are to become like God by His Grace, and truly His adopted children, but we never become like God by nature. According to some Church Fathers, this transformation especially occurs through the Holy Eucharist, for when Christ's Holy and Precious Body and Blood become one with ours, we become Christ-bearers and "partakers of the divine nature." On February 7th Our Holy Orthodox Christian Church commemorates, honors and entreats the holy intercessions of the following Saints, Forefathers, Fathers, Patriarchs, Prophets, Apostles, Preachers, Evangelists, Martyrs, Confessors, Ascetics, Teachers and every righteous spirit made perfect in our Holy Orthodox Christian faith: Our Righteous Father Parthenius, Bishop of Lampsacus; the Holy One Thousand (1,000) and Three Martyrs beheaded in Nicomedia; Holy Six (6) Martyrs of Phrygia who were perfected in martyrdom by fire; our Righteous Father Peter, who struggled on Monovatos; and the Holy Martyr Theopemptos and his brotherhood; Saint Aprion, Bishop of Cyprus; Saint Moses, Bishop and Enlightener of the Arabs; glorious Holy New Martyr George, from the village of Alikianus of the diocese of Cydonia in Crete; Holy Sovereign Richard of Wessex. +By the holy intercessions of Your Saints, Holy Martyrs, Holy Neo-Martyrs, Holy Bishops, Holy Ascetics, O Christ Our God, have mercy on us and save us. Amen. 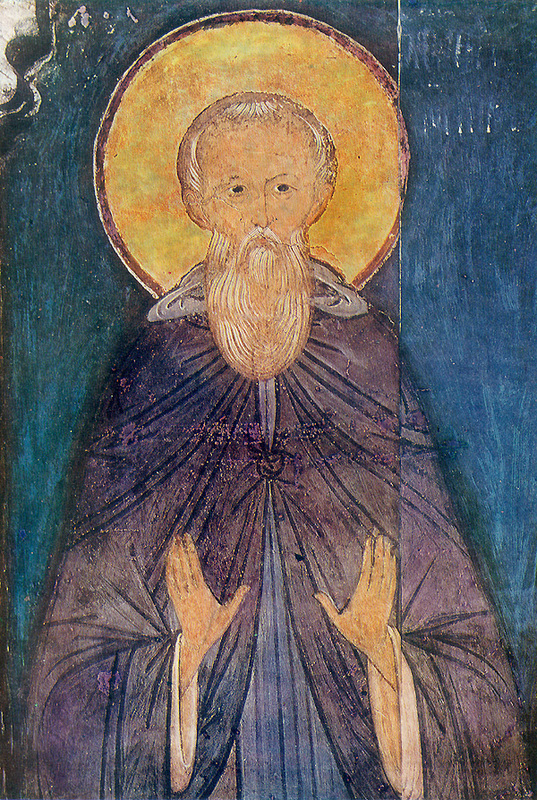 SAINT PARTHENIUS, BISHOP OF LAMPSACUS. Saint Parthenius was the son of a deacon from the city of Melitopolis. He knew the words of the Gospel by heart from his early youth, and strove to fulfill them. Settling beside a lake, he caught fish, and sold them and shared the proceeds with the poor. By God's Providence, he was chosen as bishop of Lampsacus. He cleansed the city of paganism, closed the temples dedicated to idol-worship, built many churches and strengthened the faithful. He healed all manner of sickness through prayer, and was especially powerful over spirits. At one time when he was about to drive the evil spirit out of a madman, the evil spirit begged him not to. 'I will give you another man, into whom you can enter and in whom you can dwell', Saint Parthenius told him.' And who is that man?' 'I am he', replied the Saint, 'come and make your abode in me.' Hearing this, the evil spirit fled as though burned by fire, crying out: 'How can I enter into the house of God?' Saint Parthenius lived long and showed in his deeds the greatness of his lover for God and man. He entered into the Eternal peace of Christ in the 4th century. "Behold what manner of love the Father hath bestowed upon us, that we should be called the sons of God" (I John 3:1), and so we are, O blessedness! O God's love for man! O how much God's love has accomplished! O how profusely has God's grace abounded! Poor and rejected sinners are made the children of God! The Apostle of Christ wonders at this and says, "Behold what manner of love the Father hath bestowed upon us, that we should be called the sons of God", and so we are. For what is more astonishing than that a sinner should become a child of God? God's love toward man has wrought this. What is more glorious than to be called and to really be a child of God? God's grace has bestowed this on man. It is glorious to be the child of an earthly king; it is incomparably more glorious to be the child of God the Heavenly King. This honor, glory, merit, nobility, and name is more excellent than all titles of this world. For this, glory to God Who loves mankind! If Christians are children of God, they are also heirs, "heirs", then, "of God, and point-heirs with Christ" (Romans 8:17). If they are children of God, what then, and whom should they fear? Why fear traitors, enemies, the devil, demons, death and Hell? God shall stand up for them. "If God be for us, who can be against us?" (Romans 8:31). We receive this most exalted gift of God in Baptism, for then we men are born of God and receive this most glorious title. Beloved Christians! Let us remember our Holy Baptism and this most exalted mercy which God then showed us: we then became children of God. Glory to God for this! But it is required of children that they should be like their parents, "That which is born of the flesh is flesh; and that which is born of the Spirit is spirit" (St. John 3:6). Therefore Christians must be like God as they are children of God. Let us therefore show in deed that we are children of God. God is Holy, let us also be holy. God is Righteous, let us also be righteous. God is Good, "for He maketh the sun to rise on the evil and on the good, and sendeth rain on the just and on the unjust" (St. Matthew 5:45); let us also be good and do good both to our friends and to our enemies, to those that love us and to those that hate us. God is compassionate, let us also be compassionate and show mercy to our unfortunate brethren. God hates sin, let us also hate every sin and turn away from it. God loves us, let us also love one another. God forgives us our transgressions when we repent, let us also forgive men their transgressions. The Apostle of Christ admonishes us to do this: "Be ye therefore followers of God as dear children" (Ephesians 5:1). When we show such character in ourselves, then we shall be true children of God and we shall receive both the inheritance and all good things promised to the children of God in Jesus Christ the Lord.